WHY HOST AN OUTDOOR MOVIE NIGHT? Outdoor movie events (also know as Movies in the Park, Movies under the Stars, Movies by Moonlight) are activities that bring friends and family out of their homes and into the community to enjoy an outstanding show under the stars. The uniqueness of an open air cinema and the sheer size of the screens used attract audiences. Through word of mouth and media attention outdoor movie events can attract a following from within the community and surrounding areas. Want to attract a large viewing audience? What better way to do that than with free admission. You can recoup your costs by selling concessions and sponsorship. Start planning 2 - 4 months in advance. Decide on a weeknight or weekend date. Check school and community calendars to make sure your night doesn't conflict with other events. Decide on a location with a large space where families can spread out and relax. Concessions Coordinator: Purchase or solicit food and drinks. Nothing goes better at a movie than popcorn. Rent or borrow a popcorn machine for that night. Sponsorship Coordinator: Solicit sponsors for your movie night. Create a PowerPoint slide show of sponsor's advertisements. Play the slide show while the audience arrives and settles in. Clean Up Crew: Provide trash bins and clean up the site after the movie event is over. Outdoor cinema companies that produce high quality outdoor movie events normally book up quickly. 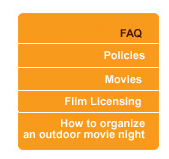 To obtain the date you want, give the outdoor cinema provider at least 2-3 months notice. Make sure you understand what is included with their services (screen, projection, audio, power and insurance). Ask for references of their three most recent events. You need a license to show movies in public - whether or not you charge admission and even if your group is non-profit. Getting a license is a simple process. Remember to consider your audience demographics when choosing your movie title. See Film Licensing section. Your movie should arrive from the movie licensing company no later than 2 days before your event. Test the movie out to make sure there aren't any problems with the film and your equipment. If you have any problems with the movie, notify the movie licensing company before your event. Provide the outdoor cinema provider the copy of the movie that was sent to you from the movie licensing company. Remember to pick the movie back up after the show. Announce your next movie or other upcoming events. Ship the movie back to the movie licensing company. If you charged admission for your event, complete the audience report.